Our topic taxonomy is now live, and we’ve retired legacy taxonomies. 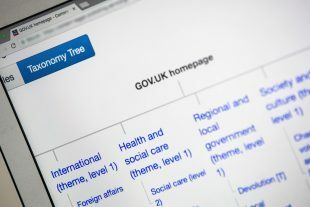 It’s been a while since we last blogged about the GOV.UK topic taxonomy so it’s time for an update. We’ve made huge strides over the past year towards our vision: a single sitewide taxonomy that powers front end navigation. In July 2018 we rolled out taxonomy tagging to all users of the Whitehall publisher app. We ran user research lab sessions then iterated the interface based on what we learned. We knew that some publishers would need to continue tagging to specialist sectors, so we deliberately preserved this legacy functionality as an optional step and pre-populated fields based on topic choices. We know that we need to do more to make it easier for publishers to tag their content accurately. We’ve fed our insights into new designs for an improved interface, which will be picked up as part of a broader mission to improve the publishing workflow. What this means in practice is that taxonomy-driven contextual navigation (for example the sidebar and breadcrumbs) now appears on most content pages. This means that users can now navigate easily from content pages to topic pages. Originally some branches of the taxonomy were manually curated from scratch (for example Education) and some were based on legacy taxonomies, then populated using machine learning. We’ve spent some of our time over the past 6 months iterating all the branches to get them to a state where we could make them live. This does not mean the taxonomy is finished though – it will always be growing and changing and publishers are helping us improve it. Retiring legacy taxonomies is a big part of the job to deliver a single sitewide taxonomy – the clue is in the name! We identified a little-used taxonomy for policies and policy areas, carried out extensive analysis to make sure removing them would not adversely impact users and retired them. Retiring policies and policy areas meant we had to end the email subscriptions associated with them. We did not want to just move subscribers to the equivalent topics without giving them the choice, because even though topics are extremely similar to their legacy predecessors in almost every case, they’re not necessarily identical. We also wanted to avoid spamming users with dozens or even hundreds of emails telling them their subscriptions were ending. We decided to send one email to each user, telling them how many of their subscriptions were ending and suggested equivalent topics they might want to subscribe to. By linking to the topic and not a subscribe form, we’re giving users the opportunity to check the content is useful to them before they subscribe. You can continue to feed back on the taxonomy by emailing taxonomy-governance@digital.cabinet-office.gov.uk. Si is a Product Manager on GOV.UK.